Newbury Town Council introduced the Newbury Town Civic Award twenty one years ago and eight years ago a new award was launched, the Newbury Town Young Persons Civic Award. This award aimed specifically at young people up to and including 25 years of age. Last year the first Business Civic Award was given to a business that is community minded. The three awards run alongside each other and are presented each year to 'hidden heroes' who, in the opinion of a panel of judges, has made an exceptional contribution to the Newbury community. We would ask you the public to consider who you think is eligible and nominate one or more people for the Award. Please complete the nomination forms below. All data collected will be used for the purpose of The Newbury Town Civic Award and unless requested and approved for publicity purpose will be destroyed within 30 days of the 8th of March. Closing date for nominations is: Friday, 8th March 2019, 12noon. The Newbury Civic Awards 2018 are on their way, the nomination round has now closed for this year, thanks to all those who have nominated a good neighbour. The 2017 Newbury Town Civic Award and the Newbury Town Young Persons Civic Award were presented at the Annual Town Meeting of Newbury Town Council on Monday 20 March 2017 by the Mayor of Newbury, Cllr Julian Swift-Hook. Katy Hawthorne was presented with the Black Horse trophy as the winner of The Newbury Town Civic Award Scheme 2017. The award recognises the town’s unsung heroes, those people who have made an exceptional contribution to our community on a voluntary basis. Katy has volunteered at the Volunteer Centre for 31 years, regularly attending on Tuesdays but swaps and does extra days to fit the requirements of the team. She is a vital member of the volunteer car service team organising transport for Newbury residents who are unable to use public transport. Over the years, Katy has been an amazing fundraiser for Naomi House Children’s Hospice and for the Swings & Smiles charity and now for the West Berkshire Community Hospital Rosemary Appeal. Katy gives generously of her time to neighbours and friends taking them for hospital, doctor and optician appointments. Diane Batten received an award and was highly commended, for her work assisting vulnerable young people in Newbury. She worked in a Bank and often encountered people having problems and issues in their life. She has since changed her job and works as Manager at the Helen & Douglas House Charity Shop where she is calm and supportive of her volunteer staff and particularly of those with special needs. She continues to help young people on a one to one basis, e.g. she found shoes and a suit for a young man who had to make a court appearance and has given vulnerable people food parcels. She recently put out a plea for a pair of shoes for a young man and she often counsels and acts as an advocate for young people in distress. Sadly, not all the people she helps make it and she has attended the funerals of more than one person she has befriended. The winner of the Newbury Town Young Persons Civic Award, sponsored by the Swift Group of Companies, was Natasha Williams who received the crystal trophy and an experience day of her choice. Natasha volunteers at ‘Swings & Smiles’ and the Guides as well as helping at the lunch time club at Trinity School, where she is at 6th form, mentoring younger students. She selflessly sacrifices so much of her time for the benefit of other young people with great empathy, humour and kindness. The Mayor of Newbury, Councillor Julian Swift-Hook, congratulated all of the nominees for the Awards and thanked the Swift Group of Companies for their continued sponsorship of this event. Pictures taken on the evening can be found by clicking the image below. 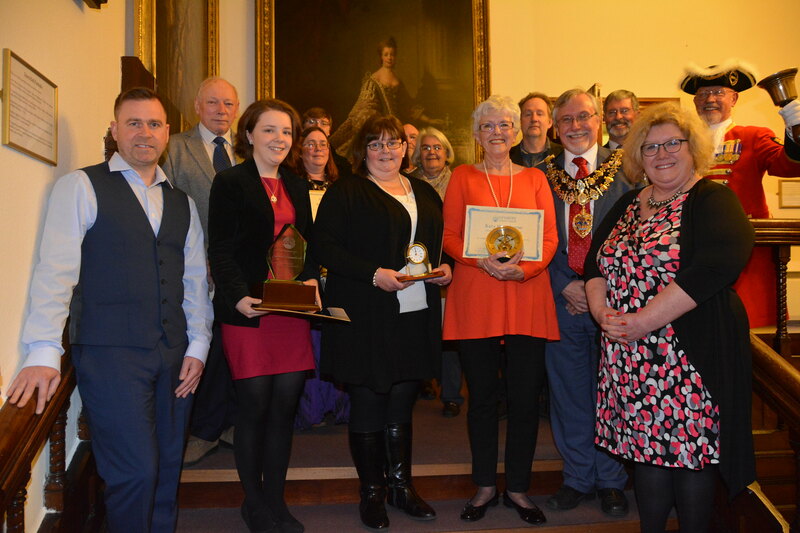 There was great excitement at the Town Hall when the Newbury Town Civic Award and the Newbury Town Young Persons Civic Award were presented at the Annual Town Meeting by the Mayor of Newbury, Cllr Howard Bairstow. Rosemary Lister was the winner of the Black Horse trophy, the award which recognises the town’s unsung heroes, those people who have made an exceptional contribution to our community on a voluntary basis. The winner of the Newbury Town Young Persons Civic Award, sponsored by the Swift Group of Companies, was Ashley Reade who received the crystal trophy and an experience day of his choice. Rosemary has volunteered for Home-Start West Berkshire since training in 1998. She has tirelessly offered her support to families across West Berkshire through their home visiting. To date she has supported approximately 25 families. Rosemary also supports the Home-Start Family Group which runs weekly during term time and gives an additional 3 hours of her time to the group which supports 6 to 8 families at any given time. She is a great team player, able to quickly identify where support is needed and never afraid to be proactive in her approach. Everyone knows that Rosemary is there when a pair of very safe hands is needed. - Lynne Taylor who has been a volunteer at Dingley West Berks since June 2015 and gives one day a week of her free time. Lynne has developed excellent bonds with the children and works hard to help them achieve and develop. She also volunteers for Home-Start every week. - Brian Arnold who has been a Volunteer Driver for Newbury & District Cancer Car Trust since April 2009. Every week Brian takes patients, 5 days a week, to their appointments and sometimes carries out two trips per day. - Paul Black who has been attending the Community Furniture Project for around 4 years and has been mainly helping to run the bicycle workshop. Paul has recycled all used wood within the CFP and has turned these items into garden equipment such as bird feeding tables, bird boxes and planters. - Graham Young who joined the group of volunteers that litter-picked for the national ‘Clean for the Queen’ campaign. It transpired that Graham goes out every Sunday morning with three bin bags and collects a bag full of re-cycling, a bag full of glass and a bag full of rubbish without any support for the benefit of the whole community. Ashley Reade, the winner of the Newbury Town Young Persons Civic Award has been volunteering at the Newbury Community Furniture Project for 12 months. He was initially referred by Castle School for work experience one day a week and after he left school he carried on the placement at the project and now attends 2 days a week. His enthusiasm and attitude towards his volunteering is impressive. When he started at the project it quickly became apparent that his skills lay in practical work, specifically bicycle maintenance. He has continued to develop his skills in the bicycle repair workshop where he is now undertaking Laser bicycle maintenance training. Ashley also plays for the CFP football team and is again very committed to his role. Also nominated for the Young Persons Civic Award was Selina Jones who volunteers in two autistic societies in Newbury and has done this for several years. She has a positive attitude and selfless commitment to helping others, giving generously of her time to the benefit of many in our community. Here are all the pictures taken by Colin Lewis for Newbury Town Coucil at this years (2016) Civic Awards Ceremony.